Spend your Summer on the beach watching Dolphins! Property 4: Spend your Summer on the beach watching Dolphins! Climb Aboard "The GREEN JEWEL"/Sleep on a Vintage Sailboat! Walk to the BEACH! Property 5: Climb Aboard "The GREEN JEWEL"/Sleep on a Vintage Sailboat! Walk to the BEACH! NEW! Stately Norfolk Home w/Grill - Walk to Beach! Property 10: NEW! Stately Norfolk Home w/Grill - Walk to Beach! Become a Beach Bum at the Beach Bungalow - Hot Tub, Kayaks, Wi-Fi, & SAND!!! Property 16: Become a Beach Bum at the Beach Bungalow - Hot Tub, Kayaks, Wi-Fi, & SAND!!! 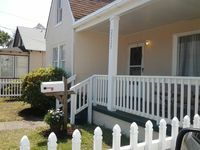 1BR 1.5BA Sandswept Carriage House - Beach! WiFi! W/D! Spacious! Property 30: 1BR 1.5BA Sandswept Carriage House - Beach! WiFi! W/D! Spacious! This is definately for the budget conscious. Small and cozy. The description is very accurate. It's an old house and drafty with character. George was great to work with and responded to questions and needs promptly. He was very accommodating to ensure we enjoyed our stay. 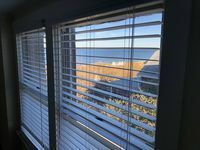 The view of the bay was great from the bedroom window, the bed was very comfortable and the unit was clean. The downfall was a small kitchen with a gas stove and little to no ventilation, so you could smell the gas from the pilot light, we put a blanket up between the kitchen and living area. Also the TV from the lower unit was right below the bedroom, so if people were watching TV you could hear it. We would definately rent a unit from George again. Nicely located by beach and main road.